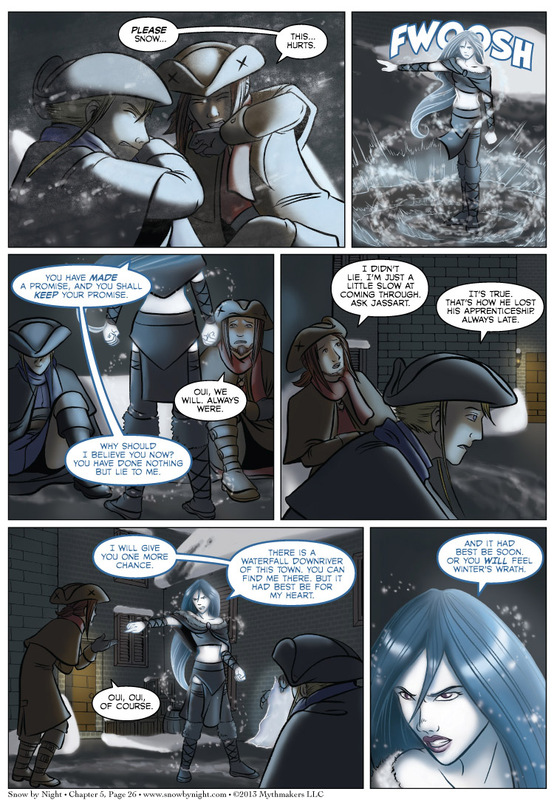 Snow-by-Night gives the boys an ultimatum in Chapter 5 Page 26. To see Brittany’s inks for this page (she added her own commentary to panel 3), please vote for Snow by Night on Top Web Comics. Also, Brittany and I will be headed to Ohayocon this week. We’ll have books, prints, and buttons. If you’re coming to the convention, please stop by and say hello. Finally, we have a pretty big announcement on Friday. It’s good news, and I’ll let Diane tell you all about it at the end of the week. Question: do they even know what form Snow´s heart could have taken? Good question, and it will be addressed in Chapter 6 by Mathilde.